Can Open Innovation help to save the world? Dr Chesbrough is Executive Director of the Center for Open Innovation at the Haas School of Business at UC Berkeley, and inaugurated the whole field of research into Open Innovation with his 2003 book, “Open Innovation: The New Imperative for Creating And Profiting from Technology“. A proposal that the ideas of Open Innovation could usefully be applied in the context of log-jammed discussions over technologies to address climate change and renewable energy sources. A “type two error” is when a project is cancelled, that actually had the capability to generate lots of value. Any process that decreases the chance of type one errors is likely, at the same time, to increase the chance of type two errors – and vice versa. That’s a fact of life. No company can have perfect foresight – given that markets change, technologies change, and projects change, all in unpredictable ways. Chesbrough noted that cancellation is often surprisingly ineffective for innovation projects. A company may withdraw its formal support, but the project can continue nevertheless. For example, people inside the company who believe strongly in the project may work on that project outside of formal work hours, and may even cease employment at the company, in order to continue working on the idea in a new startup. What happened to the projects that were shut down by the company (Xerox, in this case), but which had at least a temporary external lease of life? The majority of these projects failed – providing an element of vindication for the company’s decision-making process. But a number turned into spectacular successes, generating more stock market value in new companies outside Xerox than the value of Xerox itself. (These startups include 3Com, VLSI, and Adobe.) This again raises the question: in retrospect, can a parent company (Xerox, in this case) improve its decision-making and other innovation-review processes so as to reduce the impact of these type two errors? To be successful, the new mindset requires different skills from before – particularly skills in ecosystem management and IP management. The really interesting question addressed by Chesbrough in today’s presentation is as follows: can these new skills help address issues of failed innovation management in the context of ideas for addressing runaway climate change, and the adoption of sustainable energy sources? Nike and Creative Commons are calling upon other companies and stakeholders to bring the network efficiencies of open innovation to solving the problems of sustainability. GreenXchange will seek to bring together stakeholders in working groups to discuss strategies for advancing the commons by exploring ideas such as using patent pools, research non-assertions, and using technologies that support networked and community-based knowledge transfer and sharing. Networks work best with a standardized and simple set of protocols. The Internet is one example of a network based on the TCP/IP Protocol. The Creative Commons community is a network based on users of Creative Commons licenses who share content under these standard transfer regimes. For the proposed network of sustainability innovation, the core protocols relate to the freedom to experiment and conduct research, the standardization of transfer of ideas, and the use of technology to monitor and quantify downstream impact. Nike and Creative Commons share a vision of creating an open innovation platform that promotes the creation and adoption of technologies that have the potential to solve important global or industry-wide challenges. Open innovation is characterized by leveraging knowledge shared across many participants in a market, including companies, individuals, suppliers, distributors, academia, and many others to solve common problems and to assist internal innovation. Open innovation is an investment in the capacity of the market to support a firm’s ability to innovate and implement revolutionary technologies. It enables the development of new business models that leverage the creative output made possible by open collaboration to create new value and products. Open innovation is also a key component of engaging the resources and capabilities of large communities in finding ways to create sustainability, such as developing new ways to promote efficient resource use, implementing green manufacturing techniques, and delivery of products to consumers with lower impact to the environment. The particular problem that Chesbrough mentioned as likely to obstruct progress in ongoing talks about measures to avoid runaway climate change is the following one. Companies are, understandably, trying to develop new technologies that could help with processes such as carbon capture and storage, or moving to new sources of energy. Being accountable to shareholders, these companies are driven to gain maximal financial return from the intellectual property they invest into these technologies. With such a mindset, there is a risk that these companies will take decisions that result in the rough equivalent of the type two errors mentioned earlier: projects are stopped, because companies don’t see how to gain adequate financial return from them. One response to this dilemma is to decry the financial motivation. But another response is to seek a more enlightened operating model – once which will deliver both financial returns and highly worthwhile products. This deserves more thought! 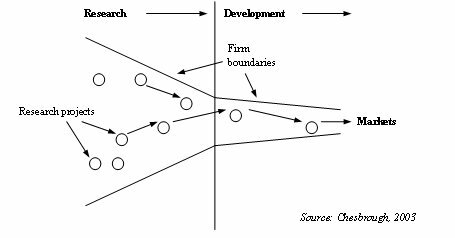 Footnote: The “Open Innovation blog“, by Joel West, one of Henry Chesbrough’s co-authors, is a mine of useful ideas about Open Innovation. I shall upload some of his photos ..
below is one with you! One of the big challenges I suggest is in explaining and bringing people into the open innovation way of thinking. In fact the act of doing that influencing has perhaps as significant a part to play in effecting the changes as the resulting interaction. There is a strong need to explain and maintain understanding through facilitation and involvement by the change leaders as well as suitable tools and mechanisms to underpin the new or additional way of operating. Perhaps as a consequence, calling it open innovation works for the people who understand and promote it but purposefully avoiding the word innovation is probably important for everyone else; making it part of a programme of change is more likely to succeed and introducing the many aspects of it as separate pieces is likely to get more uptake of the overall concept. 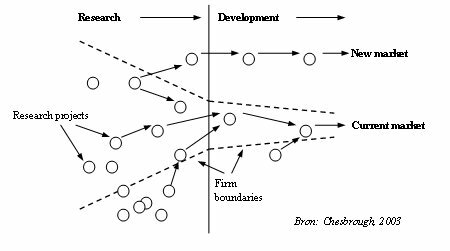 You make a good point about the pivotal role of change leaders / facilitators to enable people and companies to transition to this different way of doing business through sharing (rather than hoarding) IP. Those of us who see the need to help lead this change also need to learn effective ways to communicate. As you say, the name “Open Innovation” doesn’t work for everyone. Naming is important! Do you have any suggestions on different language to use?